Darren Windus charged to his first RXAus.com.au Australian Rallycross championship open class victory at Winton Raceway in a dramatic conclusion to the 2018 series. Meanwhile, Steve Glenney, Will Orders, Fionnan McCallan and Jarrod Keyte won their respective classes in a strong finale’ to the 2018 season. Windus beat outgoing champion Justin Dowel in the six-lap Open class feature race after early leader Arron Windus – Darren’s son – spun on the opening lap thanks to a mechanical issue, despite having dominated the preliminaries. The younger Windus had qualified fastest and won all three heats plus the semi-final but found himself out of contention on the opening lap – retiring his car with a broken driveshaft. That left Windus Sr. out in front as he powered to his first major victory since joining the championship last year. Justin Dowel was second, his team having worked miracles to repair his car after it suffered steering damage following contact with a tyre bundle in the semi-final. Marcus Walkem finished third on his RXAus debut, showing the competitiveness of the AP4-specification rally Peugeot 208 in the process. Despite being unable to contest the final round, Troy Dowel claimed the all-wheel drive open class title based on the strength of his first three rounds, backing up his two-wheel drive title last year. Steve Glenney edged out Cahal Carey to take the All-Wheel-Drive Production class, arguably the most competitive category of the event. The Techsport Mitsubishi driver felt sustained pressure on his way to wins in the three heat races, however was trumped by his fellow Evo driver in a thrilling semi-final where Carey’s strategic use of the Joker saw him jump in front early in the race. From there he held on to a narrow victory, ensuring him pole position for the final. Starting second, Glenney used the joker on the opening tour of the six-lap final and used the clear track to jump Carey, when the latter jokered a lap later. Glenney edged away to take the round, while Carey held out VW Polo driver Richie Dalton in a close battle for second and third. Matt Lee, making his all-wheel-drive RXAus debut finished fourth while Ronnie Bustard failed to make the final after exiting the semi-final with damage – though ran competitively prior to that. The victory sealed the Production class championship for the former Targa Tasmania winner. Will Orders dominated the two-wheel drive category to cap off a championship-winning year for the Victorian-based driver. He won all three heats, the semi and final to cap off a dominant year – his first in a non all-wheel-drive car. Orders beat home an entertaining scrap for second, between Jason Fitzmaurice (Toyota Celica) and Conner McLeod (Commodore) in the two-wheel drive class. 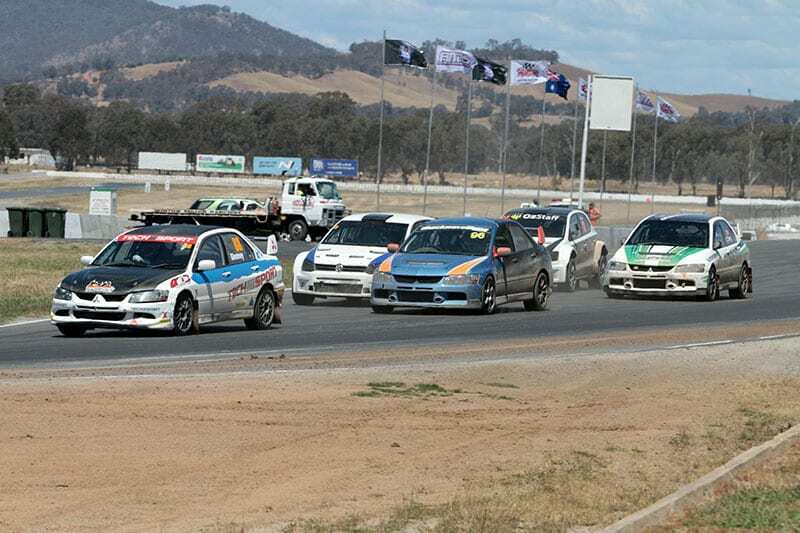 The under 1.6-litre class was hotly contested between a trio of Hyundai Excel runners and Zac Edwards’ Mitsubishi Mirage. Fionnan McCallan (Excel) won heat two, while Edwards took the second. McCallan returned serve in the third heat to give him a grid advantage heading into the semi final. He won that too over Edwards and Nathan Senior (Excel) with Shane Carey (Excel) in fourth. McCallan had looked to take the final however mechanical issues late in the six-lap finale handed the win to Edwards’ Mirage. Nathan Senior finished second and Shane Carey third. Side by Side (SXS) racing made their Australian Rallycross debut this weekend with Polaris XP Turbo driver Jarrod Keyte sweeping the weekend en route to the overall victory. He won all three heat races, the semi final and final in a dominant performance. Andrew Daniell pushed Keyte hard all weekend and led the six-lap final early after taking the joker lap on lap one. Keyte took the compulsory Joker on lap two and regained the lead and was never headed from there. When Daniell then withdrew late in the race with mechanical issues, Rob Plagemen and Mitchell Keyte battled for the final step on the podium, the former grabbing the spot after a mid-race spin from the latter. In the debut of the RXAus Sprint Series, Sean Hudgson won the weekend, based on an average of both standing start and average race lap times. Adam Bloomfield was second while Conner McLeod – doing double duties in the Sprint and 2WD – finished third. The inaugural RX Sprint was a success, with 10 entries getting a taste-test of Rallycross competition at Winton. The 2019 RXAus.com.au Australian Rallycross Championship will see the series return bigger and better next year, with a calendar to be confirmed soon.